Kampala and Cölbe, November 2011 It seems paradox: solar thermal energy use is most common in the countries of the North with the least solar irradiation, while in tropical countries water often is still heated electrically or by means of boilers. But the attitudes are changing, and local decision makers begin to explore the benefits of solar energy systems. The reasons involve both: far reaching economic and ecological long term benefits. 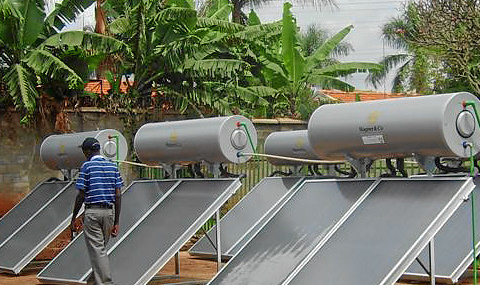 In Kampala, Uganda, Nile Breweries ltd, a large brewery that is a subsidiary of SABMiller plc., decided to turn to solar energy for water heating in cooperation with the German Development Agency GIZ. Renewable energy is becoming a mainstay for the maker of many renown African beverage brands: As part of its comprehensive green energy program, Sabmiller already established a Biogas energy plant, and the new solar installation smoothly fits into the corporation’s ambitious „10 priorities“ social and environmental responsibility program. 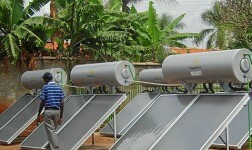 After careful product evaluation, Nile Breweries decided to enlist the services of the local renewable energy company Greentech to install a large scale solar thermal installation of a novel type: a field of six Wagner & Co Solar Technology SECUterm 300 thermosiphon systems in parallel and serial connection. Originally these systems were developed to provide safe and reliable hot water supply to single families, and asked for the reasons behind this approach Peter Hoenen, product manager for stand alone systems and in charge of sustainable technology transfer at Wagner & Co in Germany, explained: „We needed something that is rugged and reliable, something that really works, and the SECUterm systems were developed to operate independently under almost any condition.“ The solution was jointly developed with Greentech’s managing director Dilesh Karia. „The system is primarily used for the cafeteria and the showers for the workers. Up to 120 people dine in the cafeteria each day, and the showers are used by about 40 people each day, working 3 shifts“ explains Karia, who earned an engineering Masters degree in Germany. „The plant also delivers hot water to the clinic. The collectors are the first step to a sustainable future and going green“, he continues enthusiastically. Wagner & Co solar technology has more than thirty years engineering experience with solar thermal systems of all sizes, ranging from small hot water systems for households all the way to large scale district heating plants. Only recently the company, one of the worlds solar pioneers, turned to hot water systems for subtropical and tropical regions, utilizing the know-how gained in many years of thermal engineering as well as solar power projects around the world. The result was a range of innovative yet easy to install and operate heavy duty thermosiphon systems with first class collectors, storage tank and components, minimizing installation errors and maximizing ease of operation. Ultimately quality beats price – also in economic terms. SABMiller plc. is an example for a rapidly changing attitude of African companies towards environmental and energy issues. In a position paper issued on energy and climate change the Management stresses the pivotal importance of climate change mitigation and adaptation, and investments in energy efficiency and renewable energy are the first two of 8 strategies addressing these pressing problems of our time. Enlightened strategies like these may be the beginning of an energy transformation for Africa.